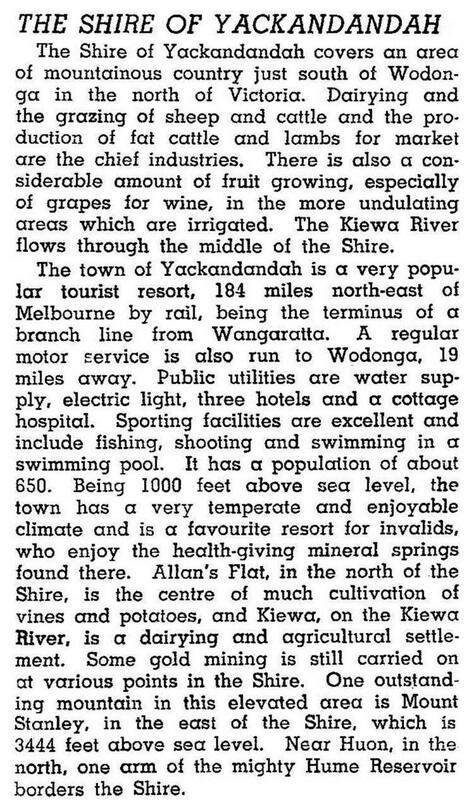 Yackandandah Shire (1864-1994) an area of 1149 sq km was in north-east Victoria, immediately south of Wodonga rural city and east of Beechworth shire. Its main centres of population and rural industry were along Yackandandah Creek in the north of the shire (Yackandandah, Osbornes Flat and Allans Flat, all former gold mining towns) and along the Kiewa Valley. The valley was the spine of the shire’s dairying and beef industries, and it contains the towns of Dederang, Kiewa and Tangambalanga. The shire’s administrative centre was Yackandandah, named after the Yackandandah pastoral run. The name is thought to have been inspired by an Aboriginal expression describing a hilly landscape. In the years after World War II the population increased, notably during the 1980s. By then the shire’s scenic values and the main town’s historic character came to be appreciated. The shire had limited benefit from railways. There was a line from Beechworth to Yackandandah (1891-1954) and a line along part of the north-eastern edge to Tallangatta (1889-1981). Yackandandah township was the shire’s main distribution centre, but restricted in the retail sense to a local catchment. Most of the shire’s shops (31 in 1948 and 23 by 1992) were in Yackandandah. In the town of Yackandandah and north eastwards to Allans Flat, numerous eateries and bed and breakfast places were opened. Dairying and beef production were the shire’s main farm industries. During the 1970s dairying declined and beef grazing increased, but the trends were reversed during the 1990s. In 1994 farming took up 47% of the shire’s area of 1149 sq km. There were 33,200 beef cattle, 17,900 dairy cattle, 8000 sheep and lambs and 6700 pigs. Yackandandah shire was proclaimed on 30 December 1864, based on the road district formed in 1862. In 1876 its northern area was severed and became Wodonga shire. Further severances occurred to Bright shire (1895-96) and the Barnawartha area was added to Chiltern shire in 1916. On 18 November 1994, most of Yackandandah shire was united with Rutherglen and most of Beechworth and Chiltern shires to form Indigo shire.